An ITIN is a nine-digit number issued by the IRS to individuals who are required for federal tax purposes to have a U.S. taxpayer identification number but who don’t have and aren’t eligible to get a social security number (SSN). The ITIN is for federal tax purposes only. An ITIN doesn’t entitle you to social security benefits and doesn’t change your immigration status or your right to work in the United States. Also, individuals filing tax returns using an ITIN aren’t eligible for the earned income credit (EIC). Any individual who isn’t eligible to get an SSN but who must furnish a taxpayer identification number for U.S. tax purposes or to file a U.S. federal tax return must apply for an ITIN on Form W-7. 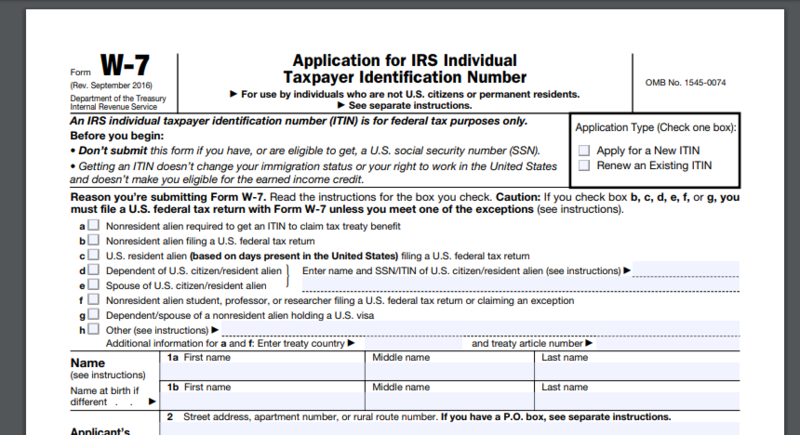 The most common reason to request an ITIN is the need to file your Federal income taxes, so you will need to have your taxes prepared (making sure the field for the SS Number is left blank in the Form 1040), and then submit your taxes along with Form W-7 and also originals of the accepted identifying documents. Follow the links below to the IRS website where you can download the Form W-7 and the Instructions to Form W-7. The process for renewing your ITIN is very similar to when you request it for the first time. You need to CORRECTLY fill out the W-7 form fields and make sure to select the correct options according to the Form W-7 instructions. The major difference is that you don’t have to send the Form W-7 along with a tax return. You only send the Form W-7 and the original identifying documents to the IRS. Keep reading for information on how you can avoid having to send your original documents. Can I fill out the Form W-7 myself? Yes, you can fill out the form yourself and submit to the IRS address shown in the instructions. However, as you may have already heard or experience it yourself, dealing with the IRS is not easy and if you don’t know how to CORRECTLY fill out this form, it most likely will be rejected and send back to you for corrections. One of the major downside to this happening is the big delay that this will create. Also, having to send your original documents to the IRS expose them to the risk of getting lost in the mail. I have filled out many of these application with an almost perfect acceptance ratio. I’m also an IRS Certified Acceptance Agent (CAA) which allows me to authenticate most forms of IDs and be able to attach certified copies along with a Certificate of Accuracy (COA) so your original documents can stay with you. The additional fee for this service can give you tremendous peace of mind knowing that your valuable original documents are not at risk. IRS Form W-7: ITIN Number, ITIN Renewal. Thinks to Look For When Hiring Someone to Assist You With This Form. As shown in the highlighted section in the image above, if you hire an authorized agent to fill out this form, make sure that the “Acceptance Agent’s Use ONLY” section is properly and fully filled out showing the agent’s information. IRS Enrolled Agent with over 7 years of tax preparation. Great service, Juan took his time and did things right! He's loves what he does and is very passionate about it. He aims high to please his clients. Overall a great experience! I used XCL Services in October 2017, and the experience was excellent from every point of view. My residence is in the East Coast, and I did visit Anaheim (CA) for a professional convention. I needed to complete some important paperwork with the State of California, but my stay would be just 4 days, and I did not have a lot of spare time. I was lucky to find XCL Services nearby; Juan Vasquez, the owner, was extremely helpful and accommodating. First of all, I could not arrive at XCL Services until 5 PM, and the paperwork took a little bit of time, which required Juan to stay after business hours to help me complete the process, and wait for the computer system to send a reply accepting the application. Juan was professional and efficient completing the process, but he was also personable, patient, and knowledgeable. His office was a comfortable place to complete the paperwork and wait for the system to respond, and was conveniently located. I do understand why there are so many positive reviews regarding Mr. Vasquez's services. I would definitely recommend XCL Services to a friend, and would consider using its services again. I have done my taxes with Juan Vasquez for a couple years. One thing that really struck me was Juan’s tax knowledge and his willingness to help me understand my finances. This year, I asked lots of questions, and he was patient, helpful, and professional. I definitely recommend XCL Services! After being audited and investigated by the IRS many years ago due to a crooked tax preparer who was cheating with customer taxes' we were skeptical of "tax preparers". XCL Services and owner Juan have been doing our taxes for several years now. He is very patient, very thorough, answers tax questions in a way we can understand and his level of integrity was the cherry on top. We had to file several schedules and he was very detailed with everything . I highly recommend XCL Services to anyone looking for a tax preparer for life! 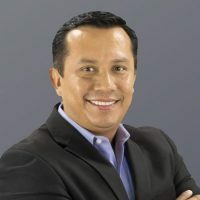 I've been doing my taxes with Juan for several years already and my experience has been outstanding every single time. He truly shows passion to his job and very meticulous when he process my tax files. He is professional and wisely advice me on my finances for the following year. I commend Mr. Vasquez to everyone for his services. Kudos Mr. Vasquez! My husband and I have been doing our taxes with Juan for almost 7 years. He has always been very thorough and makes the process easy. The return is just a bonus when dealing with him! 😃 He also helped us to buy our first home. We look forward to many more years with him as our tax preparer and realtor!